Who Am I To Share? When Wil was about 2 years old, I found out we could have a social worker come to our house as part of the Early On program, that helps families “adjust” to having a child with special needs. Wil aged out of Early On at age 3, but that one year I had with the social worker was so beneficial, that she became my therapist, and I’m working with her to this day. And “working” is the correct term. She is very compassionate, but she also really pushes me. She is always helping me t…o grow a little more, push a little further, and though it is not easy, I know, from all of our past experiences, how very freeing and gratifying that growth is. I’ve shared many of those growth experiences with you, but sometimes, I’ll go back to that old insecure place in my mind and wonder, who am I? Who am I to share when I still have so much to work on? I’m not a skilled therapist. And, I do the same thing in my mind sometimes with sharing my experiences with running. I do well and work hard, but I don’t win the races. I’m not as skilled as many out there. So, who am I to share? But, I’ve learned to answer that question, instead of letting it stop me in my tracks. I am not a therapist, I am not an elite runner, I am a work in progress, and always will be. I love growing, and learning, and doing the best with who I am, even though on occasion my old “perfectionist” self still likes to voice it’s opinion. I’m a person that has learned the difference between selfishness and self-preservation. I’m a person that has earned who she is now, and to be both proud of my accomplishments that have gotten me to this place and also to know that everyone earns things in their own way. We each have value and a great story that we have learned in the process. Just because my story isn’t perfect, or elite, or highly educated, does not mean my story does not have value. I don’t need to win a race or be perfect to know how to get through this life, but I sure can learn a lot from those that have a higher education or more experiences than me. My experiences are true and they are real, and because of that, even if they aren’t perfect, they may just be the right words for someone going through something similar. I know others who have helped me so very much by sharing their stories, and so, the question really is, who am I not to share mine? This Down syndrome thing, it’s not an easy life, but it is a really good life. My favorite part (well, there are lots of them), but this is one; laughing about the challenges. Last night, I met a woman whose son has Ds, and is 21. Even though she is way ahead of me in this adventure, we have an instant connection. There is just this knowing between one another. And, she says, “You know that stubbornness our kids have? Well, it doesn’t get easier, they just get more stubborn!” And, we just laughed and laughed, and shared some of our stories. And, we fully agreed, it’s a challenging life, but wow, it sure is a good one. We both get that, together, because we live it, together. The world moves fast for our kids, and sometimes it’s difficult for them to communicate when they get frustrated. So they just shut down. When Wil was in kindergarten, he used to crawl under the table and refuse to come out. He also was, and still is, really good at plopping down on the floor and refusing to budge. It is no joke trying to lift up an almost 70 pound kid with low muscle tone off of the floor when they don’t want to be lifted. Like a slippery, wet noodle that just slips through your hands. 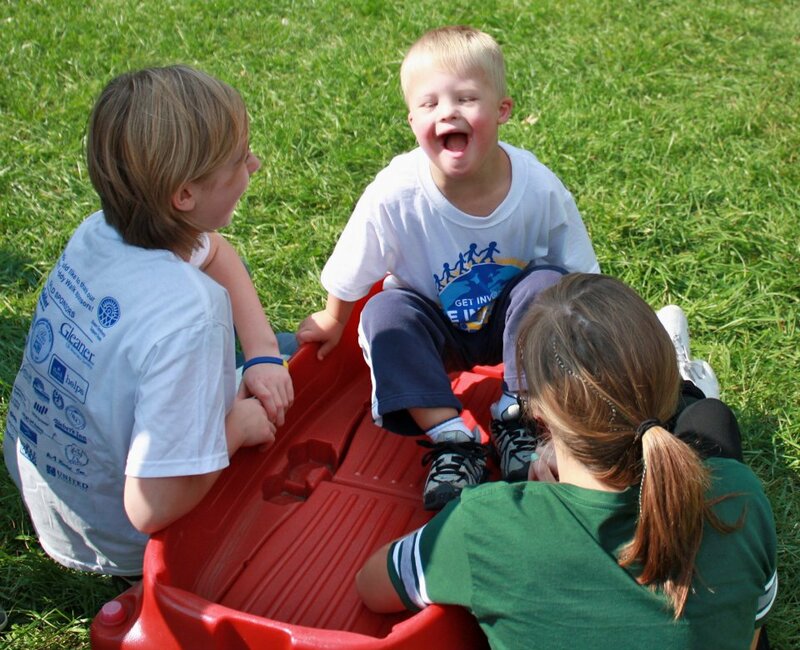 When I talk to my friend, Elaine, who’s son has Ds and is just about 2 years older than Wil, looking for advice as to what to do about the latest and greatest challenge, we mostly end up laughing to tears about it. We aren’t being flippant, or not taking it seriously, it’s just that she’s been there done that, and it’s ok. The laugher is like a hug that says, I get it, I’ve been there, and we will get through this, and though it is tough, hey, isn’t this life with our kids great?! And, that my friends is one powerful feeling. We can all move mountains when someone has our back. I did not choose to have a child with Ds, but I do get to choose how I want to embrace the Ds community, and what people I surround myself with. People are not made to be loners. So, to fully enjoy this journey, it’s important to realize we must do our part to surround ourselves with a supportive and like-minded community. I don’t want to go this alone, and I don’t want to do it surrounded by an unmotivated, reactive, pity party. Believe me, they are out there, I send them my best, but I want no part of it. I want to laugh, I want to enjoy this journey, and open up as many doors for Wil as possible. I know it’s not easy, and I am fully ok with that. Life doesn’t have to be easy to be really, really good. In fact, as much as the challenges bring me to my knees sometimes, they are what have brought the best people into my life and shown me what my strength really is. And, that is one empowering feeling! But, I can’t just hang back and hope all of this happens by some magic twist of fate. So, I put myself out there and share. I share openly, freely, and happily. Some people don’t share back, but mostly I find the more I share, the more people open up to me in a like-minded fashion, and this bond grows tight. This community I’m in is a beautiful and powerful place, and we are all moving our own mountains, together. Wil had swimming at Goldfish Swim School last night, and I was leaning against the wall in the shower area, as he played and rinsed off after his lesson. A mom walked in with her daughter, and stood near me waiting for an open shower. I didn’t really give them too much notice, when all of a sudden, the girl reaches over and gives the top of my arm a big, tight squeeze in her fist. I looked over in surprise, and the mom looked at me apologetically. It was then that I noticed her daughter had a hard time being still, she was moving and reaching and looking around constantly as her mom was trying to keep her in one place waiting for a shower. A shower opened up, and I watched the mom try to shampoo her daughter’s hair. She had to have one hand holding on to her suit the whole time, or I could see that her daughter would take off. At one point, a little boy was within this little girl’s each, and in a split second, she reached out and gave him a smack right on the nose. The little boy stepped back, shocked, and went back to his shower, hands over his nose, tears in his eyes. The mom gave the boy one of those tired looking smiles in apology. When her daughter was sufficiently shampooed and rinsed, the mom wrapped a towel around her daughter, so she could not move, bunched it up in the front, and led her out by grasping the front of the towel. I gave the mom a smile as she passed me, and she flashed that tired looking smile back. I really hope my smile gave her a little boost, a little feeling of understanding, a connection, one mom to another. I have no way of knowing, but I do know that tired smile she wore, I know how it feels, deep in the pit of my stomach. And, I do know what it feels like to have another parent show just the smallest kindness. I was wearing that tired smile at the grocery store a few years ago. It was at the time when Wil would just take off at a moment’s notice, and I’d have the twins and a cart with me, and I’d have to say, “stay here!” and run after him. I’ve chased him through the “Employees only” doors past people in hairnets, where upon seeing me, Wil would plop unmoving on the floor, me pulling his limp, spaghetti noodle body weight, and someone invariably saying, “Don’t throw out your back!” when my biggest concern was getting him off the floor so I could quickly get back to my unattended twins. ust Thursday, I went to a market after Katherine’s Tae Kwon Do class. Shopping with the kids is easy now. Nothing like it used to be. The girls are 9 and very self-sufficient, and Wil is much less likely run off (though he still has an affinity for the Employee Only doors!) As I was unloading groceries into the car with my kids, a man who was walking into the store said, “Would you like me to bring that cart back in the store for you?” Such a very simple and kind gesture, but it left me smiling and uplifted. On this Valentine’s Day, we go out of our way to show our love for another, everything wrapped in big ribbons and bows, and that is a wonderful thing. We should celebrate our love for one another. But, let us not forget, that simple, every day kindnesses can hold more significance than we realize. How Do You Find The Triumph In The Struggle? I don’t think I would be training for an ultramarathon if I did not have a child with special needs. I have no way of knowing that for sure, but I’m fairly confident that is the truth. Before Wil was born, I didn’t have any real emotional struggles in my life. I mean, we all have our stuff, our problems, our insecurities, but there was really nothing in my life that caused me to dig very deep within to deal with and pull myself out of. I was an athlete, I knew about mental and physical discipline, but I still don’t think I would have ever pushed myself as far as I do now physically and mentally, without Wil. When Wil was born, it was a struggle in so many ways. A struggle to accept his unexpected diagnosis, a struggle to handle the impact on our marriage, and the ultimate ongoing struggle of wondering if I was doing enough for Wil. Will I ever do enough or be enough for him? Though all of those struggles bore with them their own weight, the last one is the one that hits the hardest. That “enough” question is endless. There is always so much out there, yet never enough. So, it’s a question only I can answer to myself. It’s a tough one, because even the best of me is full of flaws, and insecurities. But, I have learned over time, that if I am always growing, always learning to find the lesson in the struggle, to find the triumph in the struggle, then that will always be enough for Wil, and for myself. In the ultramarathon, people from the outside looking in may say, why run that distance? How far will she have to go until it’s enough? Will it ever be enough? But, that is the wrong question. The question is, how do you find triumph in your struggles? That is a very personal question to each and every one of us, and the answer is different for each and every one of us. And, one that is only answered in the moment, as we are always reinventing ourselves in our growth. Right now, one way I have learned to find triumph in the struggle is in ultrarunning, but it didn’t start there. I first found the triumph in the struggle in training for a half marathon. I was not a runner, so this goal scared me enough to motivate me highly, along with the fact that I was running it for a fundraiser for the National Down Syndrome Society. I’ll never forget when I ran 15 miles in training for the first time. It was the longest run in the half-marathon plan. At mile 13, I’d had it. I didn’t want to go a step further. I was physically hurting, I was mentally spent. But, I had this race to run, and I wanted to run it well, so I pushed forward. Every.single.step. was a mental struggle. Keep running, Christie, come on, one foot in front of the other. Oh, but I could walk, who would know? Just walk a little, it will be ok. Yet, I knew, if I walked, even though it would be ok, it would make a mental change in me. I couldn’t honestly say to myself I had run a full 15 miles. At that time, running that distance was important to me. I had to keep running, for myself, for Wil, for NDSS. And, so I did. Then, something happened. With a half mile to go, I just started crying. I’m running down Wampler’s Lake Road, with all these cars going by, and I have tears streaming down my face. I knew I was going to make it, I had found the triumph in the struggle, and I gave it all I had that last half mile. I broke a huge mental barrier within myself. I felt sick to my stomach, but at the same time, I had never felt better in my life! 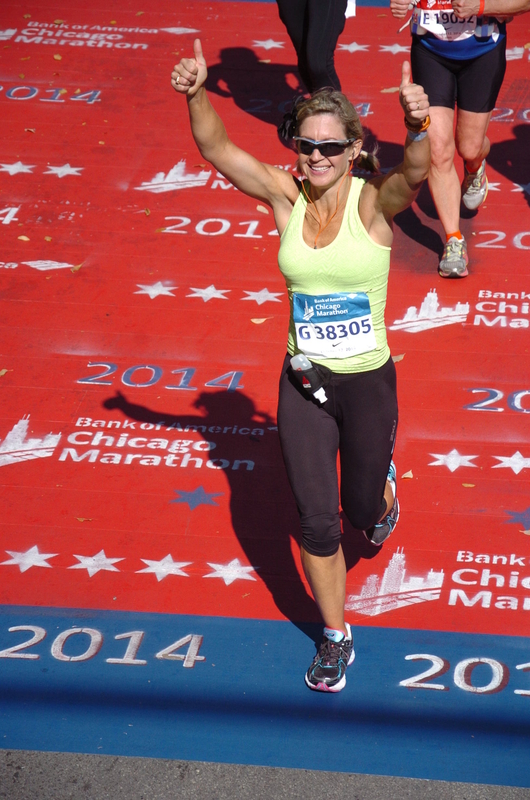 Immediately upon finishing, I texted my friend, Ema, who is a marathon runner, and a great one! I knew she would understand my feelings. She encouraged me every step of the way in training for this race, and I couldn’t wait to share with her. How true that is, in both running and in life. The triumph is always found in those proverbial last 2 miles. And, so, running, in a way, helps me train for life. It forces me to dig deep, and find the triumph in the struggle. Right now, I find that most in running greater distances. I may be exhausted and feeling like puking, but it is also a place the forces me to dig deep to find the triumph in the struggle. No one else can do that for me, it’s an inside job, and only I know if I have been fully honest with myself. So, with all of this running, and also in raising Wil, I no longer ask myself if I am doing enough. The question is, How do I find triumph in the struggle? And, the answer, well, you have to figure that one out for yourself.